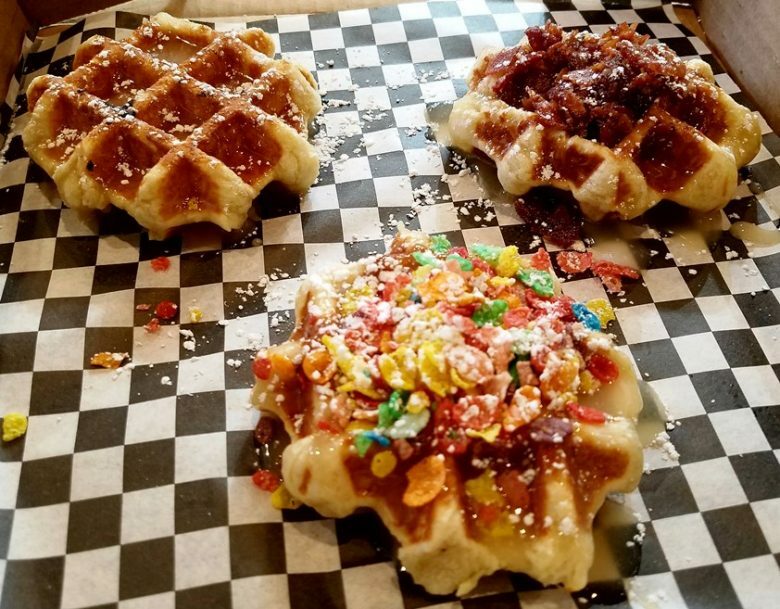 First Take: Smashed Waffles, a Fun Spot for Breakfast Eats and Sweets! Over on Hillsborough Street in Raleigh, we’ve seen a flurry of construction activity ranging from a new Target department store to the Stanhope Building at Dixie Trail. Further east you’ll find the brand new Smashed Waffles! 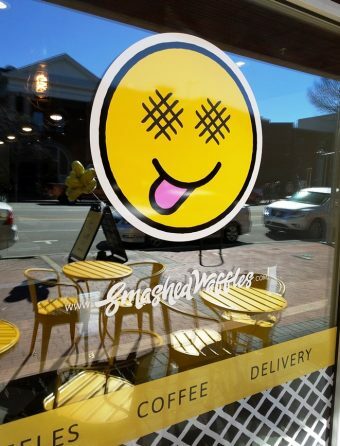 With two locations in NC (the original is near ECU in Greenville), you can probably guess who the target demographic is for Smashed Waffles: college students. 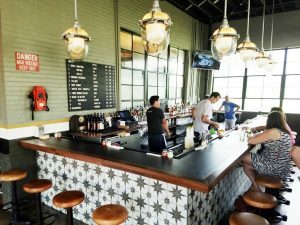 With a menu focused on coffee, drinks and waffles served many ways, it was time for a visit to see what all the waffle fuss was about! As I headed over to Smashed Waffles, you’ll immediately notice the yellow patio chairs and tables out front. A large, plastic yellow sign swayed overhead in the breeze attesting to the newness of the space, I guess they are still waiting on the permanent signage! 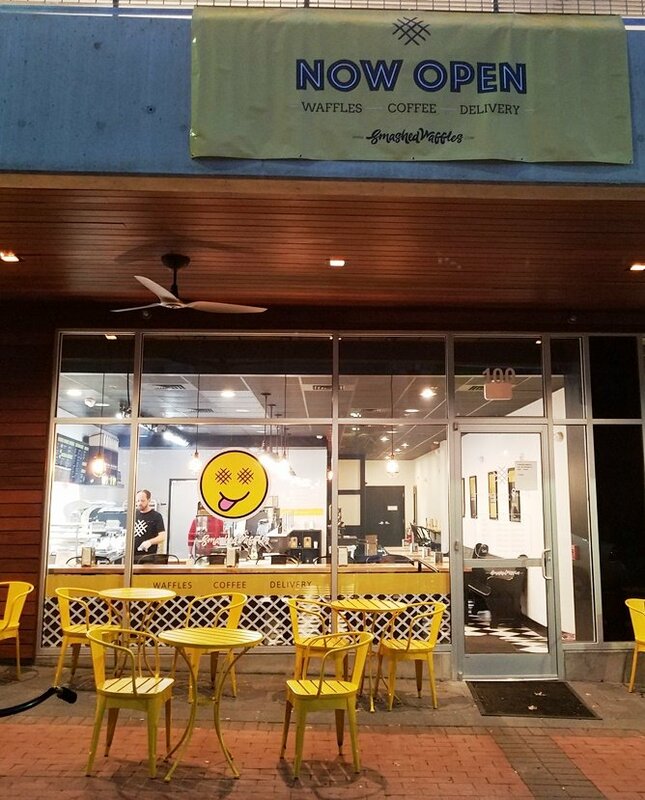 Inside, Smashed Waffles is bright, cheery and modern. The space is decked out in black and white with an order counter up front, open kitchen and cafe seating to the right. 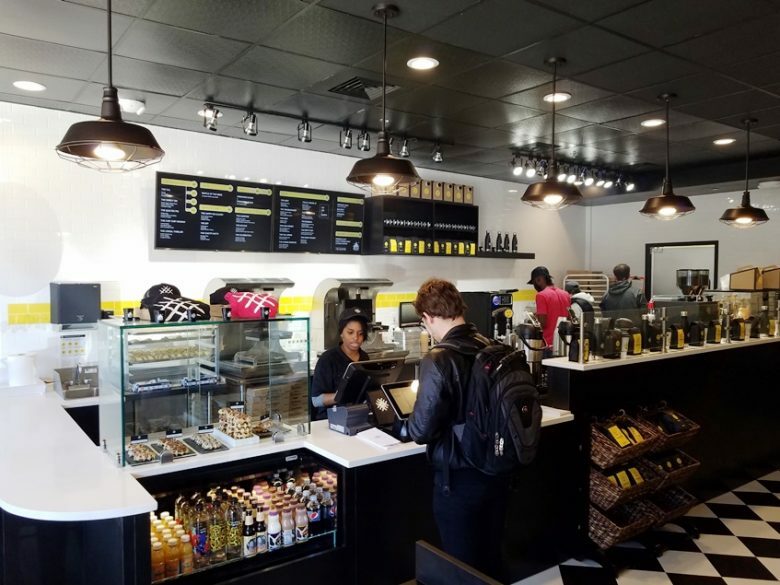 The space is tight and built for quick-service for maybe 35 hungry waffle-eaters or so. Scanning the overhead menu, you’ll be surprised at the simplicity but at the same time, you may need some time to pick out your meal. 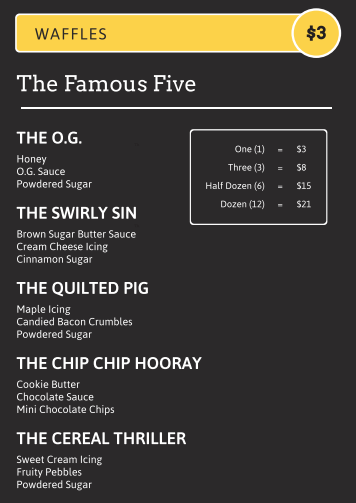 The “Famous Five” waffles come in quantities of 1, 3, 6 (half dozen) and 12 (dozen) at prices of $3 to $21. You can mix and match flavors to your content! Next up are Waffle-wich sandwiches ($4) which fall under the breakfast/lunch category to me. And then some mini-waffles and ice cream Waffle-wiches for dessert ($5)! An assortment of coffee and lattes round out the menu along with some drinks at the refrigerated case up front. 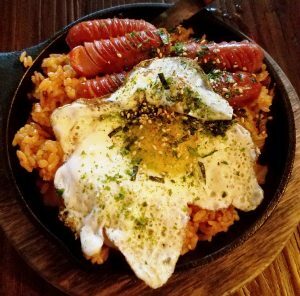 There’s only about 15 choices on the menu making for easy ordering if you know what you want. The staff here is well-trained and friendly! It’s a young crowd at Smashed Waffles with some students popping in for a meal and others lingering around a bit with coffee. The waffles are cooked to order so expect a short wait. My food arrives pretty quickly with my waffle-wich presented on a 1/4 sheet aluminum tray and my waffle trio in a cardboard pizza box. The waffles here at Smashed Waffles are substantial. Perfectly browned and about 4″ across, they’ve got some weight to the dough along with a crisp exterior. 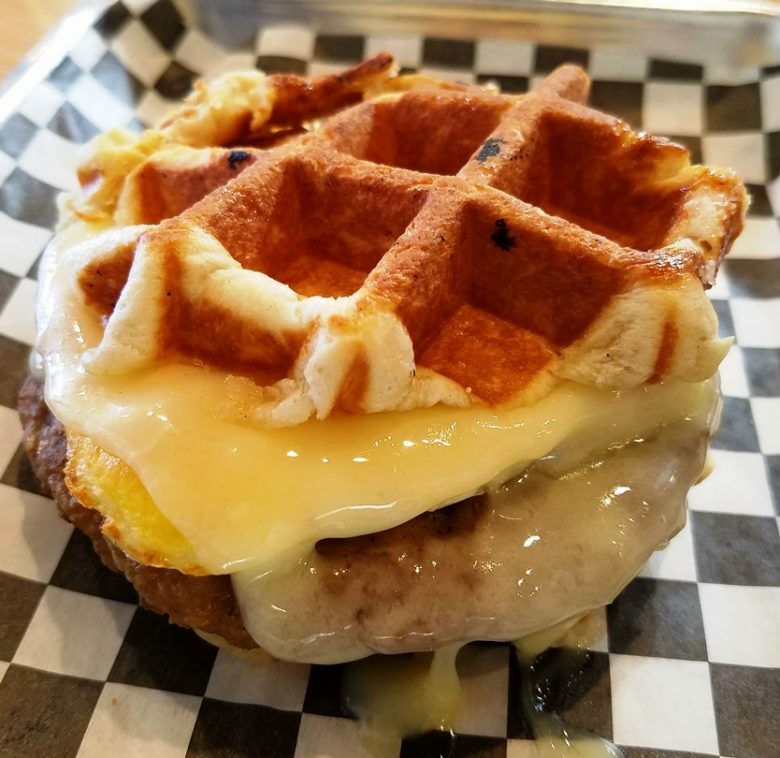 The waffle-wich is a beauty with a round sausage patty and fried egg stacked on top. 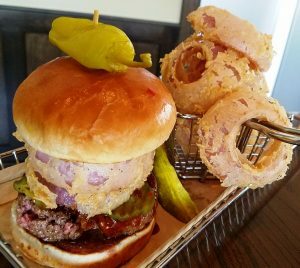 The cheddar is perfectly melted on it all making for a delicious bite. Although I wouldn’t have minded some syrup drizzled on top, there’s a lot to enjoy here! For the waffle trio I tried out the OG (honey and powdered sugar), Quilted Pig (bacon) and Serial Thriller (fruity pebbles). The waffles are all drizzled with a bit of icing for some sweet and I’d have to say my fave was the Quilted Pig due to salty bacon bits pairing well with the icing. And the Serial Thriller was a bit of a happy surprise, showing off some crunchy fruit flavor off the top. Overall I was pretty happy with Smashed Waffles and I can guarantee you that they are all pretty filling!